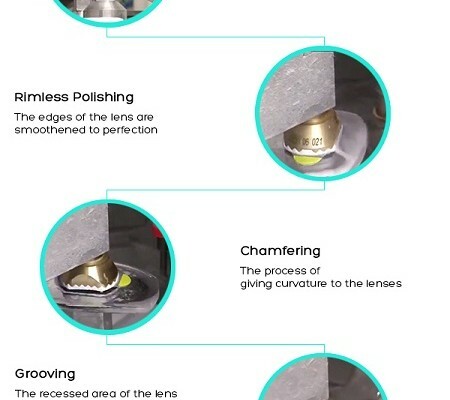 It’s only been a couple of years that contact lenses entered the eyewear industry and took it by storm. Though eyeglasses and sunglasses had a stronghold over the market for eyewear, contact lenses captured the imagination of the people who were suffering from vision problems and were tired of sporting eyeglasses for vision correction. It was a revolutionary innovation, an alternative for correcting one’s vision without letting the world know about it. Not wanting to lose potential customers, eyeglasses manufacturers took things in their stride and started exploring their creative sensibilities. That resulted in a drastic development of the eyeglasses and sunglasses segment. Quirky frames in all kinds of shapes and sizes, dazzling and subtle shades of frames and colorful lenses soon flooded the markets. And since then, there has been no looking back. But with this fast-paced creative advancement of the eyewear industry, it has become difficult for the ordinary man or woman with vision problems to choose between these two products. They are confused whether to opt for a suitable pair of glasses or to go with the hassle-free contact lenses. We’re here to help you make that perfect choice because we care for your vision. The main purpose of wearing contact lenses or eyeglasses is for vision correction. And the first thing that the wearer looks for is peripheral vision i.e. lenses which conform to the curvature of the eye, providing a wide field of view. In this case, contact lenses are a better choice since they are placed right on the cornea, thus covering the entire field of view and providing a clear vision from all the angles. Eyeglasses carry a major drawback in this respect. Since they are placed around 12 mm (about half an inch) from the eye, the peripheral vision is likely to get distorted. Also, the contact lenses create less vision distortions and obstructions as compared to eyeglasses. For people who are fond of sports and exercises, contact lenses should be the right pick. Wearing eyeglasses during sports activities may lead to their falling off or getting broken. Also, while playing, a peripheral vision is necessary and that is provided by contact lenses alone. So, make an intelligent choice. Contact lens is ideal for all weather conditions. Eyeglasses have a tendency of fogging up in the cold weather and during the rains, whereas with contact lenses on, there is no such hindrance to vision. When it comes to the ease of wearing and caring for the equipment, eyeglasses have an upper hand here too. They simply need to be placed appropriately in front of the eyes. Unlike contact lenses, eyeglasses do not require any kind of sterilization, there is zero risk of eye infections or irritation and effectively treat near-sightedness, far-sightedness and astigmatism. In case of contact lenses, people often face difficulty in wearing them especially at the initial stages. 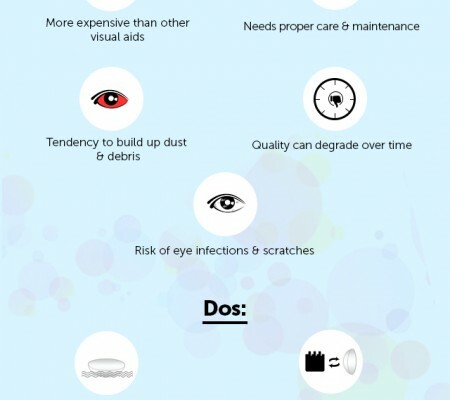 Also, if not cleaned and taken care of properly, contact lenses can easily cause eye infections, redness or irritation. They need to be cleaned everyday with the prescribed solution. Also, if accidently a person sleeps while wearing contact lenses, he/she is likely to experience dryness, redness and irritation in the eyes on waking up. Eyeglasses are definitely more cost effective than contact lenses when it comes to investment in eyewear products. They are a one-time expense and require low maintenance. 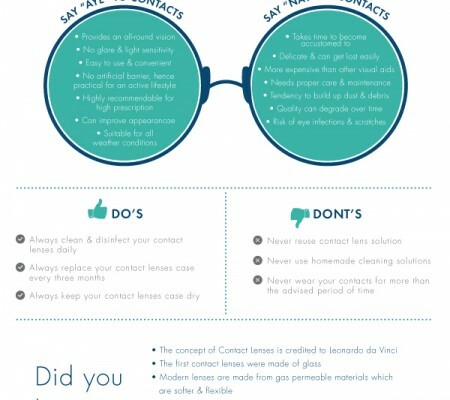 For contact lenses, however, they have to be cleaned everyday with the prescribed solution without a miss. This makes them high cost for maintenance. The growing demand for both these products has pushed producers to come up with innovative and sustainable designs in each category. The contact lenses come in all kind of vivid and bold colours to match with the wearer’s outfits. Whereas in the eyeglasses segment, an infinite range of frame styles and lenses in quirky colours are available for the wearer to choose from. Making a style statement with any of these choices is equally plausible. So, choose wisely and enjoy the perfect visual experience!